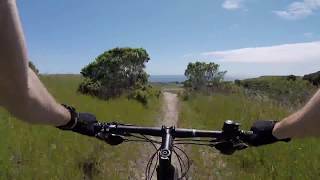 This ride incorporates the variety of terrain and trails that Wilder Ranch State Park has to offer. Starting from the park headquarters and interpretive ranch center, the ride climbs into the foothills to the north in a big figure-8 loop using old ranch roads and much of the available singletrack. There's some challenging climbing, but with plenty of breaks and spots to take in the view and catch your breath. After reaching the high point at the old Eucalyptus Grove, it's mostly downhill through a redwood canyon and then straight down an open ridge to the ocean. A refreshing ride along the ocean bluffs above the crashing waves brings you back to the start. Restrooms are next to the fee parking area at the main park entrance. This ride can also be started at the Four Mile Beach area starting with the Ohlone Bluff Trail. A pedestrian tunnel under Highway 1 connects the historic Wilder Ranch compound to the Wilder Ridge Loop trailhead. Head north where, just past the rodeo arena on the right, the trail forks to the left then doubles back almost south before turning north again in a gradual climb. Just past an overgrown pond, the trail forks again with a singletrack branching to the left. The Wilder Ridge Loop is a tale of two trails. From the trailhead straight up the ridge it's an old ranch road while the western and lower half of the loop is singletrack. This ride uses the singletrack section but for an easier ride option, or if the trails are muddy, continue on the road to the junction with the Twin Oaks trail. Hanging left onto the singletrack trail, the Wilder Ridge Loop winds along the hillside contours with the only obstacles being eroded sections of trail. Again, avoid this section during wet weather. After twisting and turning for 1.7 miles you reach the junction with the Zane Grey Cutoff. Take this trail to the right (north). Although the Zane Grey Cutoff is shown as a "short connector trail", this will be the longest 0.8 mile of this ride, as this singletrack steeply ascends back up to Wilder Ridge. It is "short" in the downhill direction. It's named after the prolific western novelist although most maps misspell the name using "Gray". Average grade is about 7% but just after crossing a gully, it climbs for a quarter-mile at 14%. Pedal or push till you reach a rockier section and the grade eases a bit until the junction with the Wilder Ridge Loop road. Turn right (east) on the road and enjoy the view from all the elevation you just gained. In about a half-mile you reach an overlook with a picnic table. Continue to the junction with Twin Oaks trail. There's a short technical section at the beginning due to erosion but once you are past this and out of the trees, it's smooth sailing as this singletrack ascends gradually through open fields for a little over a mile. Keep left where a trail forks to the right and the trail ends at a paved road. Turn right and a bit downhill to the junction of the Eucalyptus Loop and Enchanted Loop. This ride follows the Eucalyptus Loop going clockwise, so continue up the road with the old corral on the left and open field on the right. The grade is gradual with a few steeper rutted sections and about half-way up you emerge from the trees to a large open field. The old Eucalyptus Grove, a bunch of tall trees that appear to have been burnt in a wildfire, is at the top of the loop and provides some shade for a picnic area. Done resting? Continue on the loop as it heads down along the edge of the field on the opposite side that you came up. After about a mile it dives into a forest of dark redwoods and narrows to singletrack. The only technical sections are at creek crossings. A few of these areas can use some trail improvements. Another mile, and you return to the Enchanted Loop junction. The lower, more technical section of the Enchanted Loop is undergoing trail improvement work. Either direction can be used in this ride, but the easier clockwise direction is shown. Follow the singletrack to the left as it disappears into the trees then joins a doubletrack trail in a short distance. Follow this until the singletrack branches to the right to the intersection with the Baldwin Loop. The Baldwin Loop is another tale of two trails, with the western section being mostly singletrack and the eastern half a fire road. On this ride you follow the singletrack all the way down to the coast over an open ridge top dropping steeply at times over loose rock until reaching some dilapidated barns and another pedestrian tunnel under the highway. You emerge at Four Mile Beach where the Ohlone Bluff Trail winds along the coastline until returning to the start at Wilder Ranch. The cowboys are long gone but there are still a couple rock and sand quarries operating within the park boundaries and the flatlands along the coast are still farmed. The Baldwin trail is very overgrown and needs maintenance. It was like biking through brush. Great trail. With the exception of 8,000,000,000 pounds of poison oak. Make sure you do the enchanted loop and wear pants next time. Singletrack section of Wilder Ridge Loop. Lower portion of Twin Oaks. A great view spot to stop and enjoy a snack. Upper, rockier section of Zane Grey Cutoff. Mud bypass on Wilder Ridge Loop. Wilder Ridge Loop trail junction. On the best of Wilder. Historic rodeo arena near trailhead. Approaching the Old Eucalyptus Grove. Worst of Wilder Ranch - old rutted ranch road. Ocean view from Baldwin Loop Trail. taking a break after going up Zane Gray.